Rightfully so, short-term traders are taught to not question why an asset is trading higher, lower or sideways. In their narrowed perspective, it's often a fools game in questioning the impetus for a move and the difference between successfully managing risk and not. While there are endless and convenient causations to consider, the reality is that over a short enough timeframe the leaves and the trees will flutter and bend with all the uniqueness and random shutterings, as witnessed out your bedroom window and front door this evening. 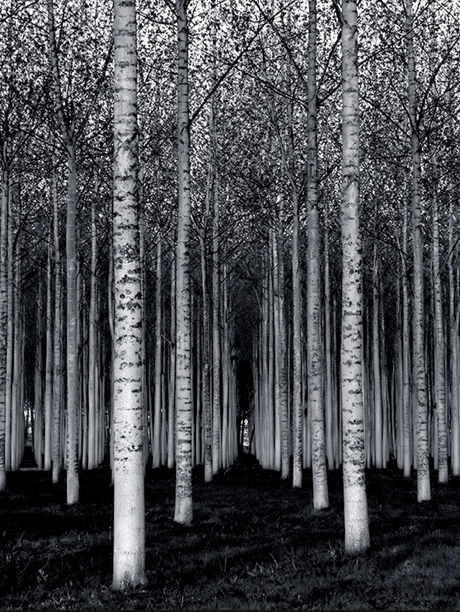 Simply put, their job is to watch the trees - not the forest. We try to keep a foot in both worlds but primarily focus on the bigger picture, because our timeframes and expectation horizons are much longer. In Grahamian logic, we use charts and our variant take on technical analysis as more of a weighing than voting machine. In our experience, this methodology provides considerable insight and intuition by contrasting the weight and disposition of a market (uniqueness and all) against the historical context that defines it. In our last note (see Here), we discussed the inter-market backdrop that has worked against precious metals since last year and why we still believe the market will resolve higher. Today, we wanted to take a broader look at the retracement level that silver has come back to twice since making a low last summer and place that level into greater historical context with respect to positioning and pattern. As much as the bears have pressed their positions over the past year, silver so far has been able to maintain a bid above the lows from last June. 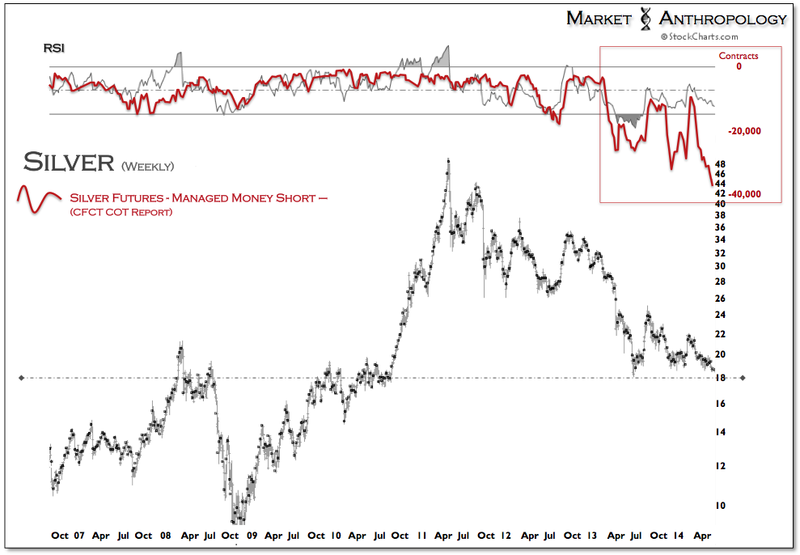 It is our opinion that with short positions becoming stretched at another extreme - while silver's underlying technicals and momentum signatures present significant positive divergences from last summers low (see red box below) - an explosive resolution higher still appears more likely here than not. highs - just as disinflationary forces began converging and blowing through the system. 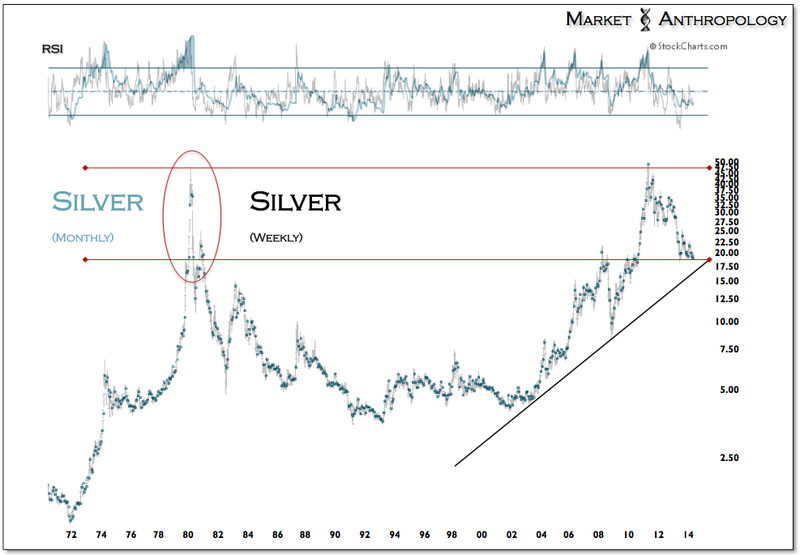 As the sector's most volatile cousin, silver subsequently failed violently above the 1980 high and maintained downside momentum as inflation expectations broadly turned lower. Last June, the market found its footings at the Bernanke pre-game tailgate level to QE2 in late August 2010. This level was also where the market in 1979 began its final exhaustive gap that completed the parabolic run for silver. 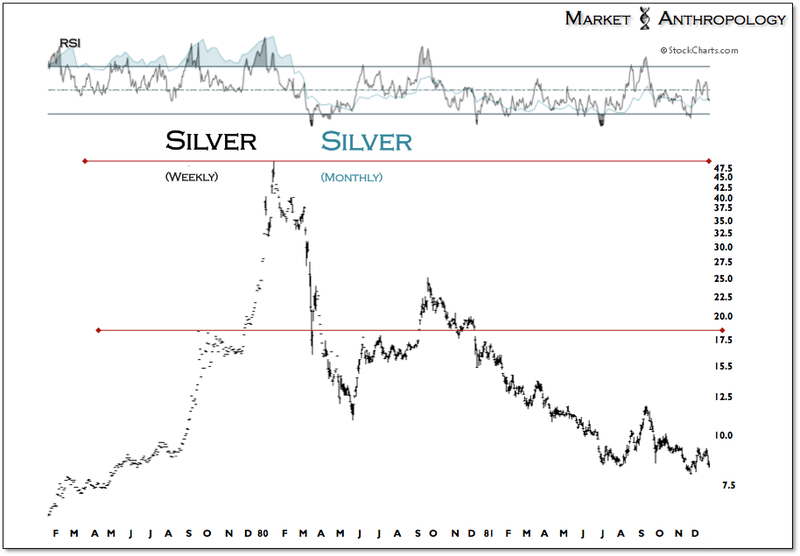 Not surprisingly, the closest long-term pattern to silver is gold. 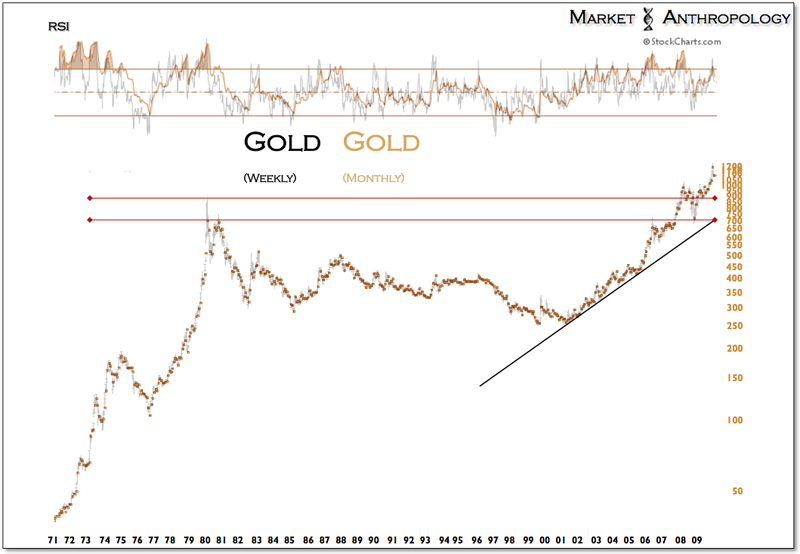 The exception being, gold has already successfully completed traversing the historic exhaustion gap range from 1979/1980 and has traded above that level since December 2008. With respect to what we know about inflation over the past several years - or even over the past 30, it makes sense that from a very long-term perspective gold has predominantly outperformed silver. It was the initial cracks of the financial crisis itself that lit the long fuse in gold, the effects of which broke the long-term highs from early 1980 in December 2007. Within less than a year, the strong deflationary winds that extended out from the financial crisis - circled and brought gold back to the top of the exhaustive gap range from 1980. With sentiment and structure in tatters, the market turned higher out of the Q4 2008 crisis lows and completed what pattern traders would refer to as a very large - but classic-cup-with handle continuation formation. Tangentially, from a comparative perspective the current market has shunned gold to such a degree that holdings in the world's largest exchange-traded products are at their lowest levels since December 2008 (see Here). Once silver and gold complete the balanced proportions of their respective retracement patterns, we expect silver will grab the performance baton and lead the breakout turn higher. How far it gets in challenging the 2011 highs will be dependent upon the nature of inflation within the system. Over the near to intermediate timeframes, that potential looks significant.